I received a shapefile from an online source, and in the attribute table it shows a column and values for latitude; but there is nothing for longitude. I have not used ArcGIS for some time, and I don't remember encountering this issue in the past. Furthermore, I am trying to align the above shapefile with one that I created with from a series of UTM coordinates. I have read a bit about the 'Projections and Transformations' toolbox but I have hit a block on choosing the right tool/s to use for this purpose. Open your attribute table and add a new field for Longitude (if it doesn't already exist). 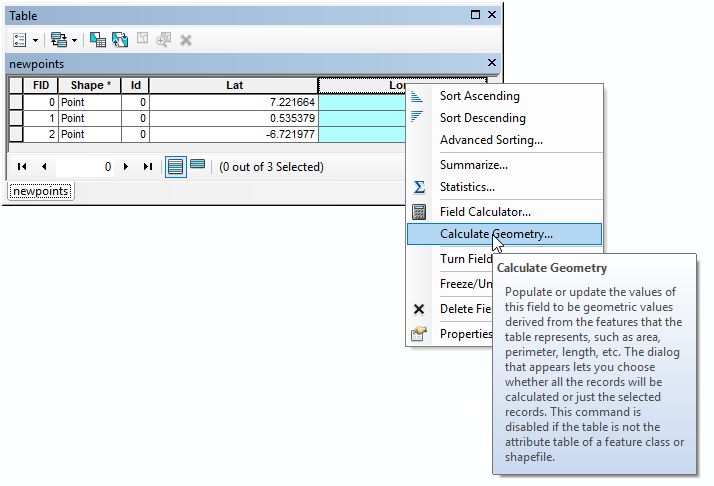 Right-click on the new field in the table and select "Calculate Geometry"
In the Calculate Geometry dialog that appears, ensure that X Coordinate of Point is selected, the coordinate system and units are correct, and click OK. This will populate the field with the Longitude values. If I remember correctly there is a tool under Data Management > Features > Add XY Coordinates. Something along those lines, that should give you two new columns in the attribute table with the information you need. Your question should state the current projection on the file you're having this issue with. Open ArcMap and import the layer > Right click and Open Attribute Table> Click on Table Options (upper left corner of the Attribute Table) and select Add Field > Right click on the new field title and select Calculate Geometry.... It gives you the option to calculate the longitude and latitude (X, Y) of the features, using either the data source coordinate system or the data frame coordinate system. The Project (Data Management) tool seems to fit your purpose. From the documentation: "Projects spatial data from one coordinate system to another." Not the answer you're looking for? Browse other questions tagged arcgis-desktop coordinate-system arcmap alignment missing-data or ask your own question. 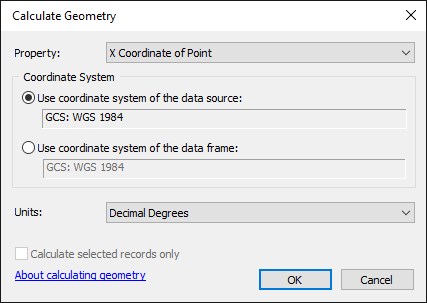 Changing coordinate systems in ArcGIS Desktop?